A Literary Odyssey: Cranford Read-Along Sign-ups. I am almost done with chapter 12 so I don't know if I should participate in the read along although I am interested. I am hoping to finish the book this weekend. I am enjoying Cranford although some parts of it did drag for me. I have the DVD waiting for me at the library to watch after I finish the book. I just finished reading this yesterday and I loved it! I look forward to reading everyone's thoughts. :-) and tweet it as well. I'll join in on this, it might be time for a cosy read! I will join for the Cranford read-along. I read the first bit of it in my British Lit class a couple of months ago, and have been meaning to read the rest of it since. I'm in. I've been wanting to read this for awhile. Thanks for hosting! I have been wanting to read something by Elizabeth Gaskell for a while. I'm in! I enjoyed reading this, even more so in retrospect. It's so short, though, I can't imagine stretching it out over two weeks. It's more of a week long read, I'd think. Hi Allie, please add me! I'd like to participate. I recently read North and South and loved it! 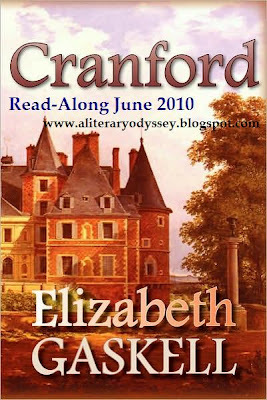 I've been reading about the friendship between Charlotte Bronte & Elizabeth Gaskell and had planned to read Cranford so I may as well join in the readalong too. I'll mention it in my Sunday blog post. Please add me to the list as well. I loved the movie, so I've had the novel on deck for a while! This is great timing for me: I'm working my way through ALL of Gaskell, almost chronologically, and I'm near the end of Ruth. I will gladly participate in the Cranford read-along! Thank you! I would like to join in also. I've never read Gaskell so I'm looking forward to reading it! I've had this is my TBR pile for a while, so I suppose now is a good a time as any to finally read it! Sign me up! Opps, forgot to say I was in.